Tuvaro is the PUP that uses misleading techniques to prevent removal. Use Reimage to locate malicious components and get rid of them faster than with uninstall instructions. A full system scan blocks virus reappearance and prevents traffic to malicious domains. HOW CAN TUVARO hijack my computer? HOW TO REMOVE TUVARO VIRUS? Tuvaro virus is a completely annoying infection, which may start causing redirects when you are browsing on the Internet. It typically takes over all web browsers, including Google Chrome, Mozilla Firefox, Internet Explorer and other ones, and starts rerouting its victims to affiliate websites. Why its developers need this? The answer is very simple – Tuvaro redirects are used to increase page rank, visitors’ traffic and similar factors. However, there is no guarantee that tuvaro.com won’t trick you into visiting suspicious, unsafe and sometimes even dangerous website. That’s why this program has already been labeled as browser hijacker and a potentially unwanted program. If you have already noticed redirects to unknown websites, an increased amount of pop-up ads, slow downs and similar issues, you should check your computer with updated anti-spyware and remove suspicious programs from it. Otherwise, you will have to deal with an increased risk of getting infected with more serious viruses. In addition, this search engine may start tracking your browsing habits and may start collecting data, which is related to your browsing history, search terms, etc. Such information is called ‘personally non-identifiable’ but we think that you shouldn’t let unknown parties use it behind your back. To sum up, we can’t say that tuvaro.com is malicious or that it is used to spread malware. Nevertheless, it is clear that this search engine is promoted using unfair methods. In addition, it may lead you to various PC-related issues by showing you altered/forged search results or by showing continuous pop-up ads for its victims. Besides, such ‘search engines’ are also actively used to track users’ browsing habits and then send this data to unkown third parties. If you want to protect yourself, please scan your computer with Reimage or other trustworthy application. 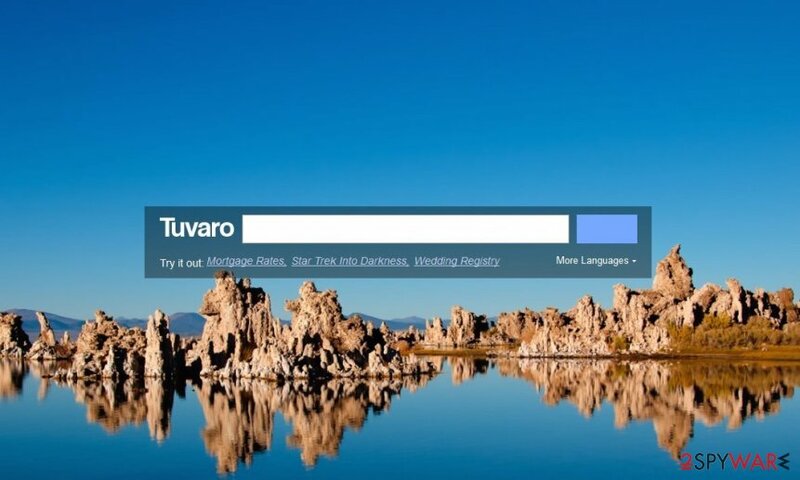 If you haven’t understood, now it’s time to realize that Tuvaro Search may appear on your PC system without any permission asked. Typically, its infiltration is closely related to freeware, shareware, misleading ads and similar techniques. The mostly used of them is called bundling. In order to avoid it, you should start checking programs before their installation. Please, avoid Quick, Recommended and similar installation methods because they can easily lead to you to the installation of unwanted components. For avoiding Tuvaro, you have to select Custom or Advanced installation of the freeware. In addition, make sure you uncheck all suspicious check marks. If this program gets on its target PC, it may alter its settings and then may start causing redirects during each of user’s browsing session. So, soon you may find out that you can’t visit Google, Yahoo or other trustworthy search engines. Besides, it can also install Tuvaro toolbar on your computer without any permission asked.. As you can see, Tuvaro Search virus is a sneaky infection that deserves to be removed. Please, do not ignore its annoying redirections because you may get infected with more serious threats! Here, look for Tuvaro or any other recently installed suspicious programs. Wait until you see Applications folder and look for Tuvaro or any other suspicious programs on it. Now right click on every of such entries and select Move to Trash. When in the new window, check Delete personal settings and select Reset again to complete Tuvaro removal. Once these steps are finished, Tuvaro should be removed from your Microsoft Edge browser. Here, select Tuvaro and other questionable plugins. Click Remove to delete these entries. Now you will see Reset Firefox to its default state message with Reset Firefox button. Click this button for several times and complete Tuvaro removal. Here, select Tuvaro and other malicious plugins and select trash icon to delete these entries. Click Reset to confirm this action and complete Tuvaro removal. Here, select Extensions and look for Tuvaro or other suspicious entries. Click on the Uninstall button to get rid each of them. Here, look at the Homepage field. If it was altered by Tuvaro, remove unwanted link and enter the one that you want to use for your searches. Remember to include the "http://" before typing in the address of the page. Now you will see a detailed dialog window filled with reset options. All of those options are usually checked, but you can specify which of them you want to reset. Click the Reset button to complete Tuvaro removal process. This entry was posted on 2015-03-26 at 06:52 and is filed under Stealing programs, Viruses. You can quickly scan the QR code with your mobile device and have Tuvaro virus manual removal instructions right in your pocket. How did you remove Tuvaro virus?